Let the ham sit at room temperature for at an hour before baking to help it come to room temperature. Preheat oven to 325 degrees and place the ham face down in a roasting pan or large cast iron skillet. Combine all the rub ingredients in a small bowl and rub on all sides of the ham. Cover tightly with aluminum foil and bake for 1½ - 2 hours (depending on size of the ham. You can also follow the heating directions that came on your ham package). While the ham is cooking, make the glaze. Add the pineapple, water, brown sugar, and cayenne pepper to a blender and blend until smooth. Transfer the liquid to a medium-sized sauce pan and heat over medium heat. Bring it to a boil then reduce the heat to medium-low and simmer for 15 minutes or until reduced by half and it thickens slightly. Reduce heat to low and keep warm until ready to glaze the ham. When the ham is done, remove it from the oven and increase the oven temp to 400 degrees. Use a pastry or silicon brush to brush about ½ the glaze all over the ham. Return the ham to the oven and bake for 15 minutes. After 15 minutes, brush with the remaining glaze and add any extra pineapple to the edge of the pan, if using. 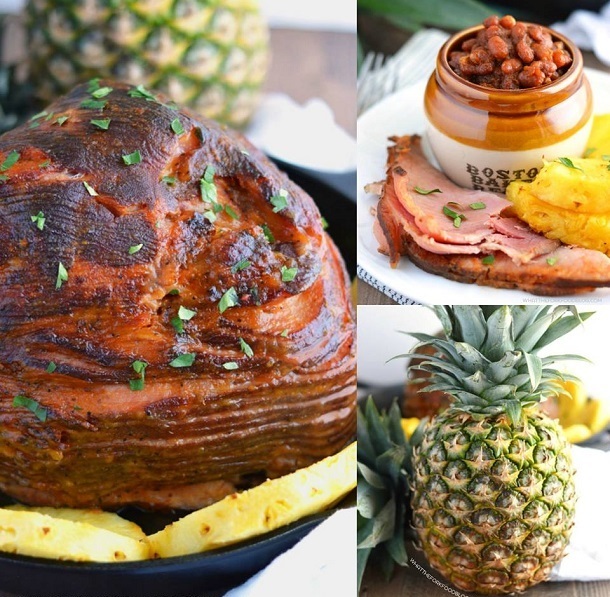 Bake the ham for a final 10-15 minutes until the glaze is caramelized and the pineapple is heated through. Let the ham rest for 15 minutes before carving and serving. Serve with the cooked fresh pineapple.